SILVER SPRING, Md. — The record albums are in plastic sleeves, behind alphabetized dividers, in waist-high racks, ready to be pored over — but the man there said the music wouldn’t play. 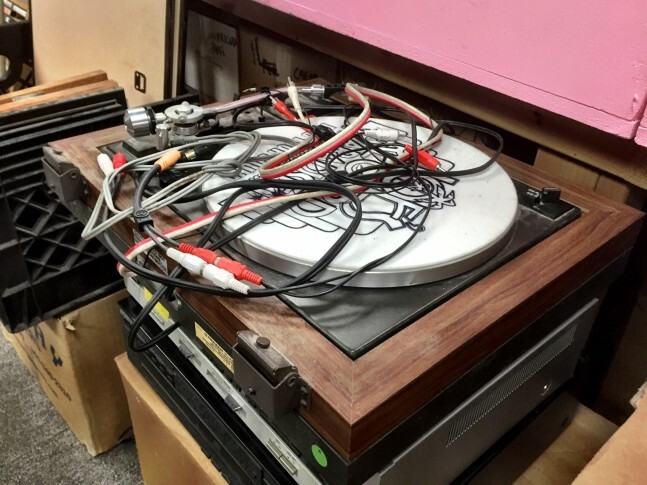 Don McLean, Bay City Rollers, and Bauhaus and thousands of used vinyl albums, CDs, and cassettes are already in display racks at the new Joe’s Record Paradise, in Silver Spring, but the 42-year-old business remains closed to customers after its latest move. “We’ve just had some snags,” said owner Johnson Lee, understating the hurdles he has struggled to clear in getting the store open again, in what he says is the store’s seventh Montgomery County location, in the basement level below SunTrust Bank at 8700 Georgia Ave., at the corner of Cameron Street. Previously, Joe’s Record Paradise was at 8216 Georgia Ave., with stops in Rockville, Aspen Hill and Takoma Park. Lee, the son of founder Joe Lee, took over the business in 2009. “We — or I, I should say — showed up pretty unprepared to the permitting office, and I was rejected,” said Lee. “It was my fault — I didn’t know we had to get a building application filled with all the proper drawings,” he said. Now, Lee is awaiting drawings from an architect, which he now knows are needed to satisfy Montgomery County’s building permit requirements. Last week, Lee launched a GoFundMe crowdfunding effort with the goal of raising $30,000 to help cover costs during the reopening process. To prepare the shop to open, Lee has invested countless hours and thousands of dollars generated by decades of selling records. But now, the delay is taking its toll. In five days of crowdfunding, the “Save Joe’s Record Paradise” campaign has raised more than $7,500, allowing him to pay his employees. As one of the longest-lasting independent record stores in the D.C. area, Lee acknowledges the challenge of keeping knowledgeable and passionate record store employees, at a time when most people download music digitally. Would-be experts — think John Cusack, in “High Fidelity ” — can learn about musicians, songs and recordings while stocking the store, said Lee. “You bring stuff up, you figure out who’s who — that’s as good an education as any,” he said. Lee said hopes his musical schoolhouse will open again, soon.